The Mulato chile has similar looks to the Ancho chile but instead of a reddish black skin it has a dark black skin. You can tell the difference much better against the light! The Mulato chile also has a sweeter, fuller and more chocolaty flavor than the Ancho. No doubt they are different as they come from different chiles. 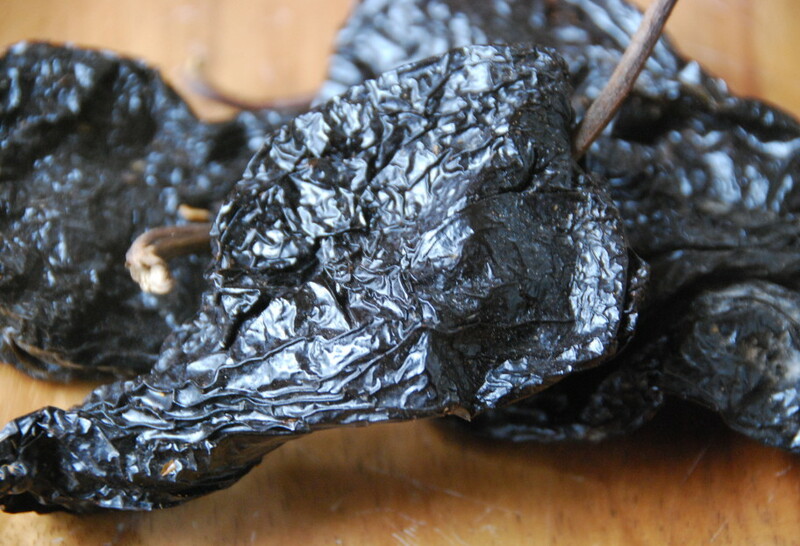 The Ancho chile comes from the dried regular Poblano chile. The Mulato chile comes from a variation of the Chile Poblano that has slightly different genes with a darker color and fuller flavor. It is hard to find the latter Poblano chile variation, as the growers prefer to dry them since they can sell them at a higher price at the markets. What a helpful resource! Thanks. You made answering this question easy and the photos were helpful too. So could you use the ancho pepper and add some chipotle from the can to make up for flavor from the mulatto? Hola Lois, You can just substitute the ancho chile for the mulato. No need to use the chipotles from the can. Hmmmmm…. Hmmmm… Hmmmm…. Hmmmm!!! Se me hace agua la boca!